Concerning findings in a report released by TI’s East Africa chapters today. People in Burundi, Kenya, Rwanda, Tanzania, and Uganda were asked about their experiences with bribery and their responses show that the police is the institution most prone to bribery across all countries (Uganda’s police service tops the list). 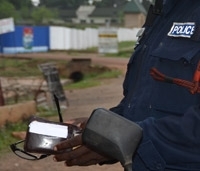 The prevalence of bribery to access a range of public and private services, from customs authorities and courts to health and education ministries, was highest in Burundi with respondents saying they were asked to pay bribes on more than 1 in 3 occasions that they accessed these services. But one of the most revealing findings comes from the number of people reporting cases of bribery to authorities. Only 16 per cent of respondents from Rwanda said they filed complaints but the rates drop to as low as 6.9 per cent in Uganda and 3.2 per cent in Burundi. The top reasons given for not reporting bribery were a lack of faith that any action would be taken and a fear of intimidation. Other reasons included not knowing where to report the incident, that the request to pay a bribe was not explicit or that the person didn’t see a need to report the case. In East Africa, where the majority of citizens depend on the public sector to provide basic services and household incomes are some of the lowest in the world, citizens can ill afford the additional tax that bribes represent. There is much to be done by governments, service providers and anti-corruption authorities to ensure that people see reporting corruption as worthwhile and that it will contribute to reducing the impact of corruption on their daily lives. There are a number of strategies that can be used to encourage citizens to report bribery, including staff training on dealing with complaints and regularly publishing information on how these complaints are resolved. Public education progammes should inform citizens of their rights and there should be channels for anonymous complaints to reduce fear of intimidation. TI’s Working Paper on Making Government Anti-Corruption Hotlines Effective addresses these and other approaches. In Burundi, Kenya, and Rwanda, Transparency International also assists victims and witnesses of corruption through its Advocacy and Legal Advice Centres, helping them to find the best authorities to act on their complaints. Tell us what you think! If someone asked you for a bribe, would you report them? Why or why not? ← Corruption – Out of Sight, Out of Mind?